Con- While both are part of Brooklyn, to much of Park Slope, Bay Ridge may as well be Dubuque, and I’m not talking about the burger restaurant of that name in Carroll Gardens. Pro- Their burger and beer concept will go well with the young urbanites. Con- Parents might get upset in wrongly assuming it’s a french baby store. Con- No one goes there anymore, it’s too crowded. Con- Not even an ironic nod to the health conscious/And does anyone under 40 even get the SNL reference? 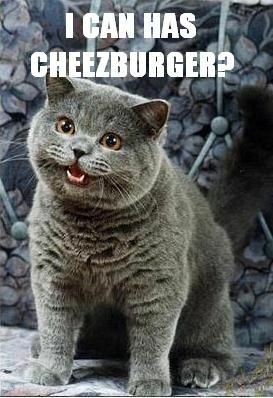 Maybe the Slope can support all these burger joints, at least until an I-N-Out Burger or Talde opens a burger restaurant and runs them all out of business. Stop the Half-Spot Hoarder Tyanny! Forget Babyccinos and bike lanes. In today’s Brooklyn Paper I finally found a Park Slope controversy I can really sink my teeth into- The Montgomery Place Half-Spot Hoarders! We’ve all been there, driving in concentric circles, looking for a spot. Up ahead you see what looks like a spot, but like a mirage it disappears as you get closer. 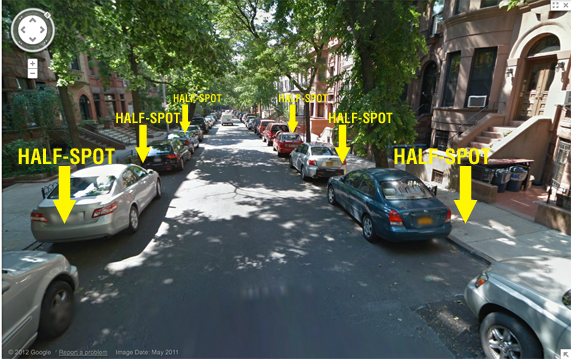 It’s the dreaded half-spot, not big-enough for a car, but an incredible waste of parking real estate. 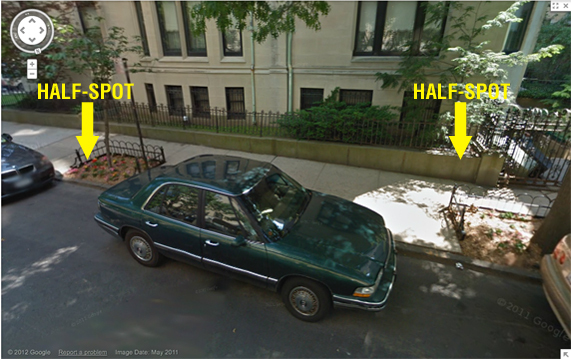 Apparently at the doormen at 27 Prospect Park West, who park the cars for its tenants, intentionally create un-parkable “half spaces” on Montgomery Place to save spots. 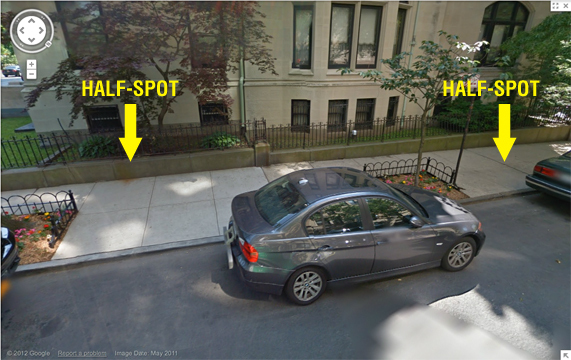 So when a resident drives up, move one car forward and one care backward, and viola, a space appears out of thin air. As someone who takes his parking very seriously, this kind of behavior infuriates me. Technically it’s not illegal, but it should be, and a felony at that! Trust me if Dante had a car in Park Slope, he would have reserved a special circle in hell for the half-spot hoarder, right between the blasphemers and the sodomites. I urge everyone with SmartCars, Minis, scooters, rickshaws and any vehicle small enough for a half-spot, and park on Montgomery Place. This spot tyranny will not stand. It’s time to take back our spots! 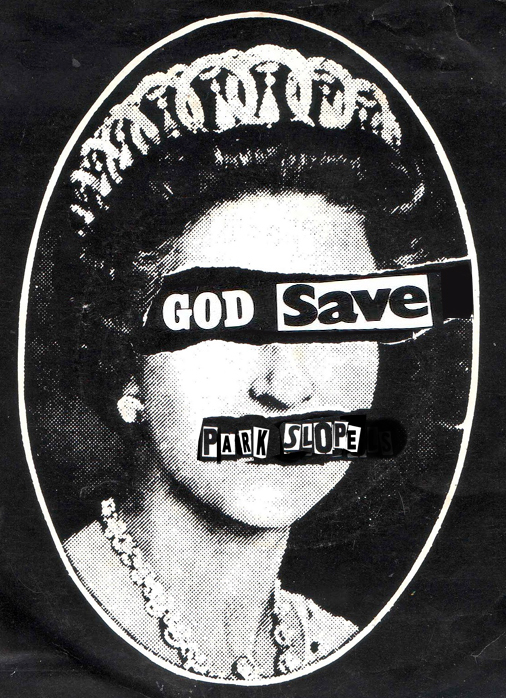 Park Slope is Dead, God Save Park Slope! Matt says, “My folks came (to Park Slope) in the seventies and it was rough, dude. Just bodegas and stuff, and this wave of ex-hippies buying houses for twenty thousand dollars.” He is just keepin’ it real. Except that it was his parents who were the gentrifiers, at least in the eyes of the people they were pushing out. Park Slope has become the punchline of jokes about yuppie parents, and overprotected children on a diet of pastured free range chicken and organic kale. The common wisdom among the blogs is that that yuppie families have killed Brooklyn, or at least Park Slope. In the last few years they have forced out the minorities and are destroying the fabric of this neighborhood with their gourmet coffee and cookies, and the neighborhood is now overrun with breeders and their double-wide strollers! This is, of course, nonsense! Sure, gentrification is going on in Park Slope, but it started in the late ’60s when the middle class were being priced out of Manhattan, and they found they could afford brownstones in the blue collar Park Slope. The Brooklyn lifers thought the people moving in were nuts, ”I couldn’t understand why a nice couple like that would buy into a neighborhood like this,” said a long time resident when the first “pioneers” moved in in the late ’60s. Can you believe that, people were complaining that there were not ENOUGH families in Park Slope? They even had a name for them, “DINKs,” dual income, no kids. Of course, people who moved in the 80’s complained about the people who were moving in in the ’90s and so on. The moral of this is unless you were neighbors of Gil Hodges, you should probably not complain about gentrification. POST SCRIPT- I’d like to correct one misconception in the newyorker article about Park Slope not being cool anymore. It is impossible for Park Slope to not be cool anymore, because PARK SLOPE WAS NEVER COOL! It was always a bedroom community with a few nice restaurants and bars. It was never the “It” neighborhood that Williamsburg, Dumbo, and Brooklyn Heights were. 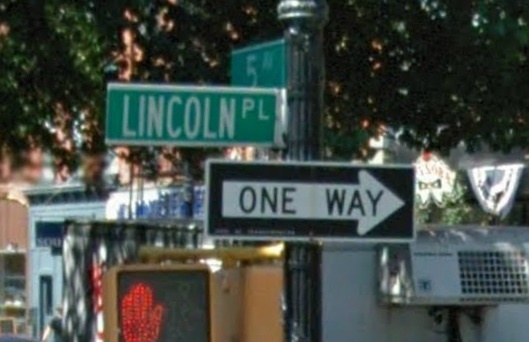 It was always the also-ran where you moved because you weren’t cool enough to live in “Greenpoint”. About 5 years ago, my wife and I were looking at an apartment for sale on the corner of Vanderbilt Ave and Prospect Place, and the realtor was speaking about the charm of the neighborhood, “Vanderbilt is really up and coming. A liquor store just opened up, and The Bob Law Seafood Cafe is just around the corner!” I wouldn’t say that stretch of Vanderbilt was desolate, but it hardly seemed up-and-coming. And a new liquor store and Bob Law not withstanding, this did not ease the minds of a young couple, one of whom was 6 months pregnant. The Vanderbilt stretch of Prospect Height has now up and came. The 5 blocks between Park Place and Pacific can now boast some of the best restaurants and bars in Brooklyn. Having overlooked its potential years ago, I was certainly lat eto discover all the new restaurants and cocktail lounges popping up, but I have now been making a point to sample them all.